Tagliatelle verdi owe their bright color to the inclusion of spinach in the dough. 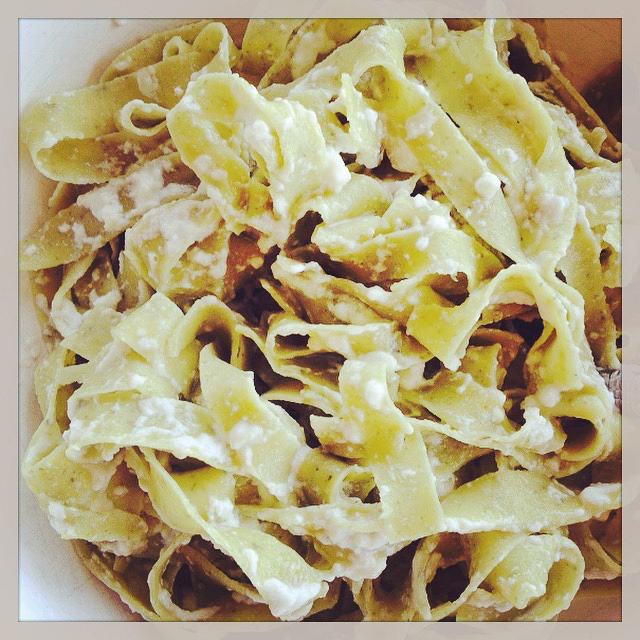 The green pasta plays the role of fieno (hay) in the classic combination paglia e fieno (straw and hay), with the role of straw played by tagliatelle all’uovo. I like tagliatelle verdi, yet cooking the spinach before making the pasta sometimes is not practical. Some years ago, I tried Deborah Madison’s recipe in Vegetarian Cooking for Everyone: her spinach variation for egg pasta involves the puréeing of fresh spinach and eggs, which eliminates the spinach cooking step. 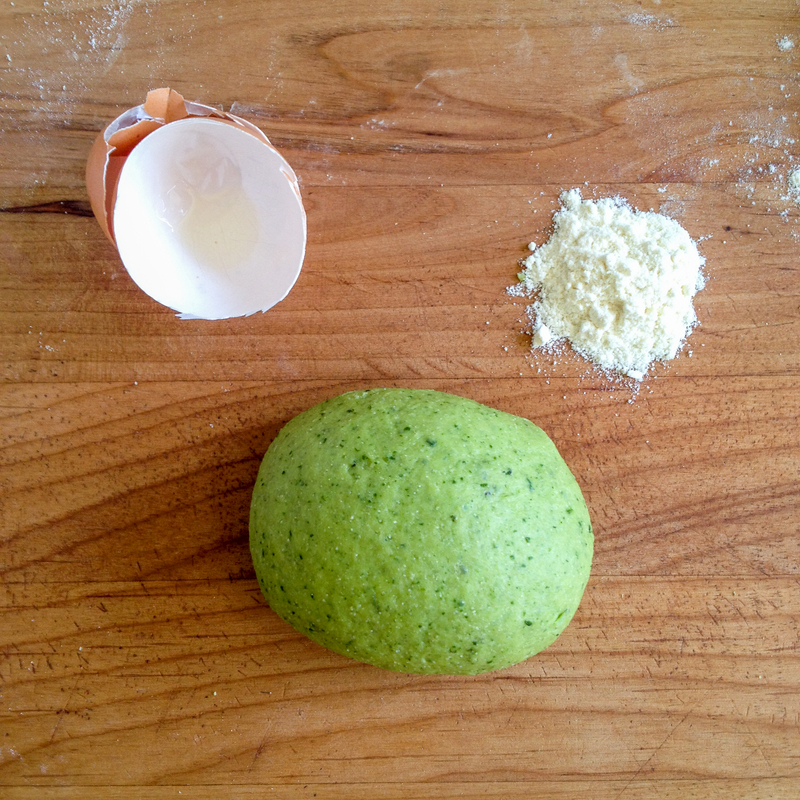 It worked perfectly: I easily combined the resulting paste with the flour to obtain pasta dough of a beautiful green color. While my attempts at growing spinach in my small vegetable garden have produced disappointing results, kale sprouts everywhere easily and grows year round in the climate where I live, which constantly motivates me to find ways to consume it. Most of my kale is of the variety Red Russian, and the rest is cavolo nero (a.k.a., Tuscan kale). If you are considering growing some of your food, try kale. My gardening skills are quite limited, yet kale thrives, generously providing me with large quantities of tasty and nourishing dark green leaves. I particularly like the tender leaves of baby kale, and it was easy to think of using them instead of spinach to make tagliatelle verdi. 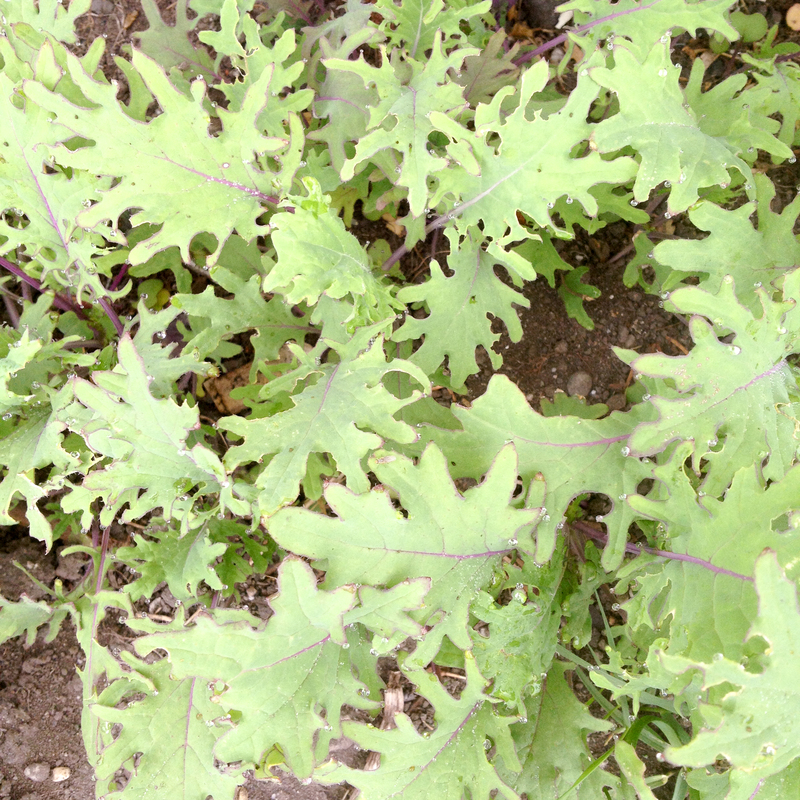 Appreciation of baby kale has increased in recent years, so until you can harvest your own, you should be able to purchase it. Note on flour: to make egg pasta, I like to use King Arthur Flour’s Perfect Pasta Blend, which includes semolina flour, durum flour and all-purpose flour. (I don’t have any business relationship with the company: this is in truth what I use.) Alternatively, you can use a blend of 50% semolina flour and 50% all-purpose flour or your preferred flour blend. Wash the baby kale leaves and pat dry. With your hands, break them into pieces and place in a beaker or similar container (mine came with the hand blender). Add the egg and process with the hand blender until the kale is very finely shredded. Weigh the flour in a bowl. 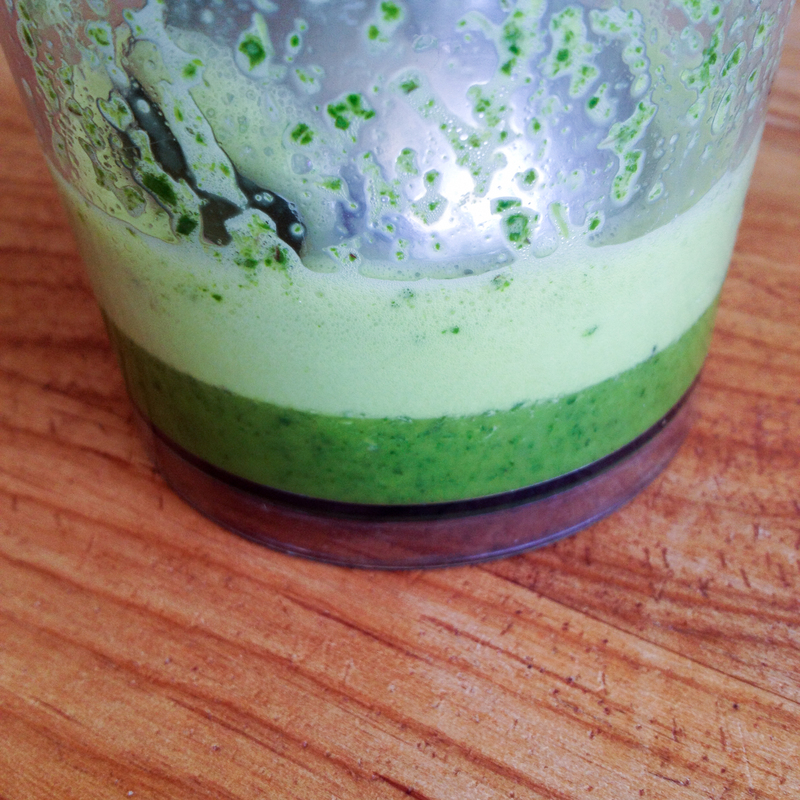 Pour the blended egg and kale into the bowl. (Make sure you scrape the beaker well.) Stir with a small fork. Add the salt and stir some more until you have a cohesive dough. Empty the bowl onto a kneading board (again scraping the container well) and start kneading the dough with your hands. Add a bit more flour blend as needed to obtain a dough that is not sticky, but should not feel hard when kneaded. I usually add 5-10 g. Knead for 8-10 minutes, folding the dough on itself towards you and pushing it away from you with the heels of your hands in a fluid motion that should feel relaxed and meditative. Cover well and let rest for about an hour. Roll the dough by hand or with a pasta machine. You may find it easier to cut the dough into 2 equal pieces, flatten both with a rolling pin and then roll each piece with a pasta machine until you are down to the last but one notch. Sprinkle the dough with all-purpose flour as needed to prevent sticking. Let the rolled dough rest for a short while. Sprinkle the dough with a bit of all-purpose flour, then cut each piece into tagliatelle (long strips that are 1/4-inch / 6 mm wide) with the machine attachment or by hand. In the latter case, fold a 3-inch strip of pasta lengthwise away from you. 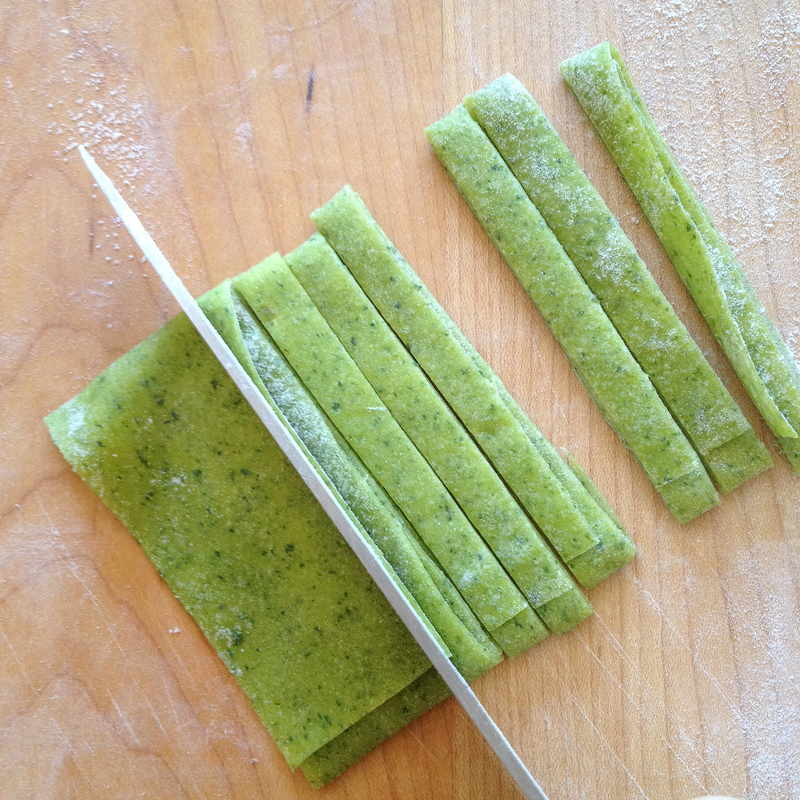 Continue to fold the strip until the entire pasta sheet is folded into a flattened roll. With a sharp knife, cut across the flattened roll. Unfold the cut tagliatelle immediately. Lay out the tagliatelle in such a way that they don’t stick to each other until you are ready to cook them. You can dress the tagliatelle as you prefer. For the batch in the photo, I chose fresh homemade ricotta. Burro e parmigiano is always an option, or a light tomato sauce (especially now that tomatoes are in season). Bring a small pot of water to a rolling boil, add some coarse salt, stir and then toss the tagliatelle in it. Bring water back to boiling and keep it there. The time needed to cook the tagliatelle is not long, so don’t wander away. Since the pasta takes only a short time to cook, prepare the ricotta as the water comes to a boil. Put the ricotta in a bowl and mash it with a fork to make a cream. If it is on the dry side, add to it a teaspoon or so of the pasta cooking water. When the pasta is ready, remove from the heat, pour a glass of cold water in the pot, stir and then drain the pasta, leaving a bit of water clinging to it. Toss pasta and ricotta. Depending on the ricotta and on personal preference, a bit of salt may be added during the tossing. Plate and serve immediately. The recipe makes a bit more than two portions (served as Italian first course). With a specialty in handmade pasta, Simona provides detailed, accessible tutorials teaching readers to cook like an Italian right from home on Live Like an Italian as well as on her own blog, briciole. 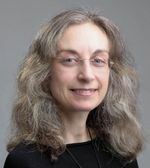 This entry was posted on July 22, 2015 by Terlato Media. It was filed under COOK LIKE AN ITALIAN, Simona Carini .